Purified Glacier Water, Herbal Blend of: *Burdock, *Rosemary, *Horsetail Herb, *Sage, *Nettle; *Korean Ginseng Extract, *Aloe Vera Leaf Juice, *Ginkgo Biloba Leaf, *Nettle Leaf, *Jojoba oil, *Hemp Seed oil, Vitamin E/Tocopheryl Acetate, Oatmeal Protein, Vitamin B5/Panthenol, Plant Oil/Cane Ethanol (gentle eco-emulsifier), Vegetable Glycerin, Essential Oils of *Clary Sage; *Sweet Grass; *Lavender, Salt, Blueberry Extract & Canadian Wildcrafted Red Clover. 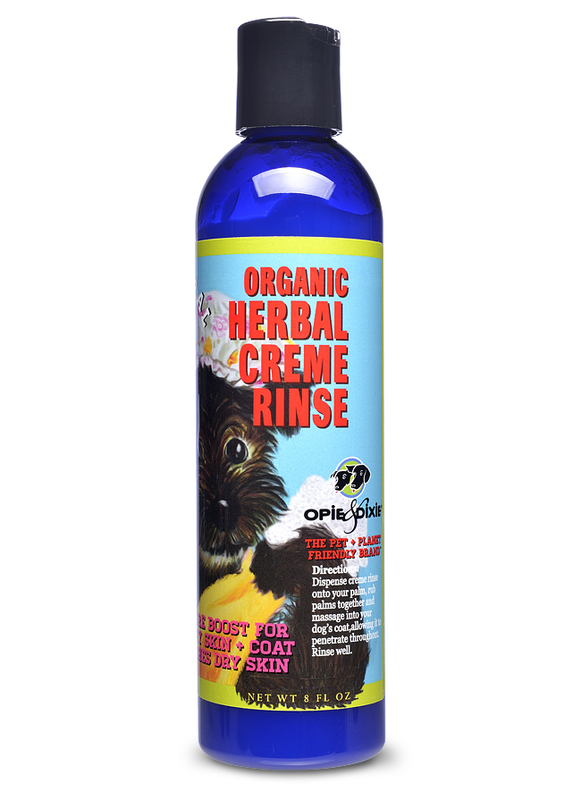 After washing your pet with one of our gentle shampoos and rinsing well, massage a very small amount of crème rinse into their fur and rinse out well. With skin and coats so soft and smooth, they're going to beg you to stop petting them!